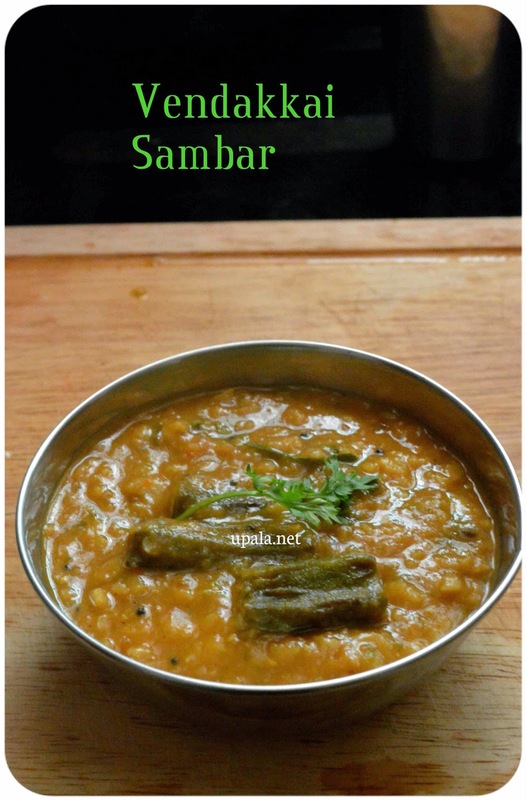 Generally during festivals we prepare a no onion sambar or paruppu kuzhambu and this Vendakkai Sambar (Ladies finger sambar/Okra sambar) fit in those days. 1) Pressure cook toor dal and keep aside. Soak tamarind in warm water for half an hour, extract juice and discard the pulp. 2) Heat oil in a kadai and add mustard seeds to crackle. Next add Fenugreek seeds, hing and fry till they get roasted. Fenugreek seeds might get burnt in high flame so maintain medium or low flame. 3) Now add Lady's finger and fry till it gets roasted and shrinks in size. Next add tomatoes and fry till it gets mashed up and cooked. 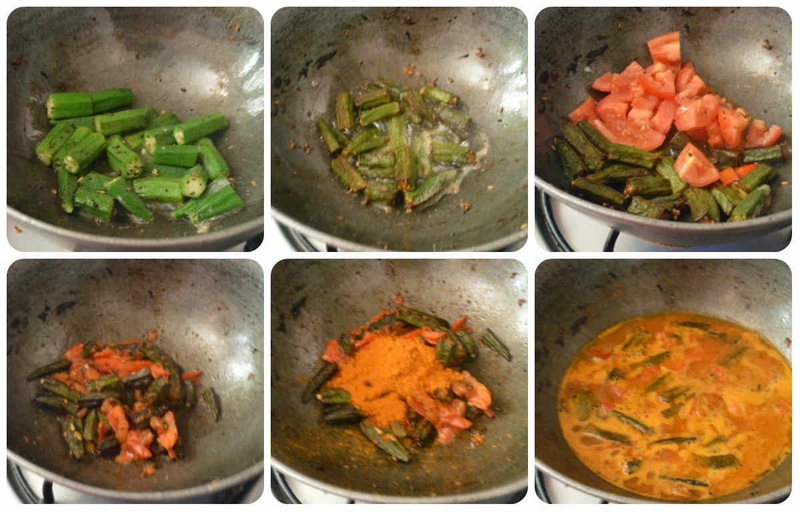 4) Add Sambar powder and give a quick mix. Now add enough water and leave it to boil till vendakkai gets cooked completely. 5) Add cooked toor dal and leave it to boil for few more minutes. 6) Now add Tamarind extract and mix well. Let it boil for 10 mins or till you get Sambar flavour. 7) Finally add Curry leaves, Coriander leaves and mix well. Switch off the flame after 5 mins. Tasty Vendakkai sambar is ready. 1) You can also add tamarind extract at step 3 by instead of sambar powder. Leave it to boil for few minutes then add sambar powder and dal. But one disadvantage in this way is that the sour taste gets absorbed by vendakkais. Many of my friends complained that they dont like the sour taste absorbed. Thats why I followed my MIL method in which she adds the tamarind extract at final stage. 2) Instead of adding chopped tomatoes my MIL prefers to grate them and add. Then she will fry them till they becomes like thokku and leaves oil on sides. This will give nice red colour to sambar also demands more oil.